February 7 is National Fettuccine Alfredo Day. Did you know that this dish isn't popular in Italy, where it was invented, but adored in the USA? Fettuccine is a kind of pasta, that is made of egg and flour. It looks like little ribbons, that is the literary meaning of fettuccine in Italian. This kind of pasta is very popular in Italy and it is usually served with cheese or seafood. 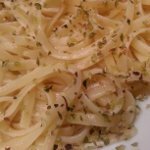 Alfredo Di Lelio, the owner of Alfredo alla Scrofa restaurant in Rome, slightly changed the original recipe of fettuccine with butter to make his own dish in 1914. He prepared it with triple butter to entice his pregnant wife, who had lost her appetite. Di Lelio didn't sell his dish to customers for years, because it was so rich. Anyway early movie stars Douglas Fairbanks and Mary Pickford fell in love with this dish while on their honeymoon in Rome in 1927. They brought the recipe to the USA and made the dish and Alfredo world famous. Fettuccine Alfredo is always delicious on its own, but you can also add some seafood or vegetables on top to make it better. Celebrate National Fettuccine Alfredo Day cooking this delicious pasta to serve to family and your friends.